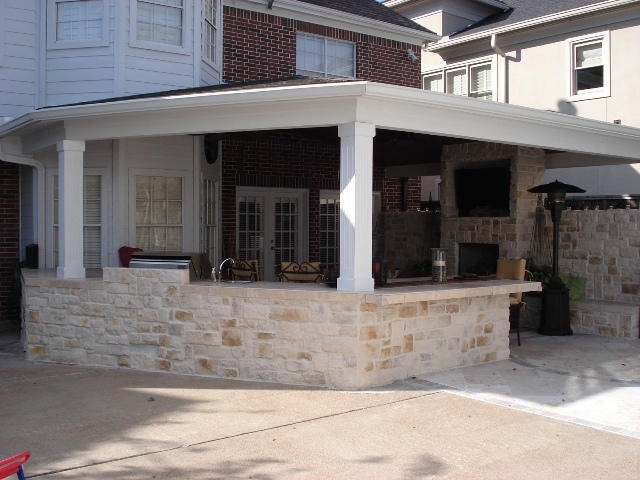 Take a look at this Houston covered patio! Isn’t it the perfect place to watch football on TV in fall? 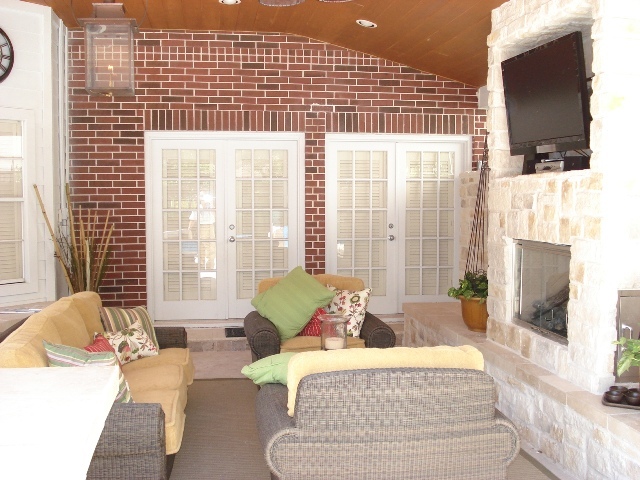 “In my opinion, this outdoor living space contains the essentials of a great football season hangout,” says Wayne Franks, co-owner of Outdoor Homescapes of Houston. This is where a Houston-area covered patio designer like Wayne is so important. 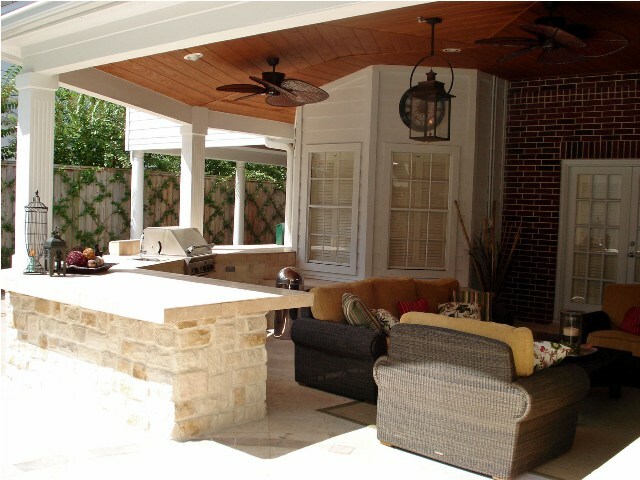 Whenever he designs a covered patio in Houston, he knows how to seamlessly integrate proper space planning with beautiful design – so the space looks and functions the way the family wants. For a proper TV viewing height and distance, the TV was placed atop the gas fireplace insert. (The fireplace and wall go up about 5 feet high, and then the TV is built into the 6-foot-high section of wall above that). Speaking of outdoor TVs — from now until the end of the football season, Outdoor Homescapes of Houston is offering free installation of outdoor TVs (an $800 value). Even the “hard lines” that come with all the outdoor structures that have given “hardscaping” its name can be balanced out with the use of natural materials. Stone – with its uneven edges and rustic, natural appeal – is an overwhelmingly popular choice for Houston covered patios. 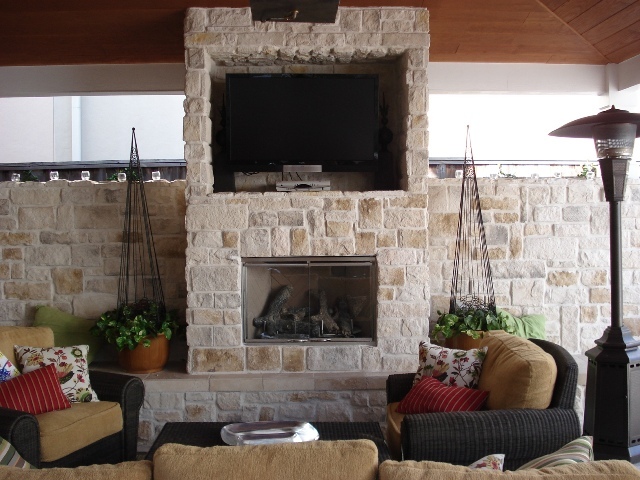 The stone used here on the fireplace, walls and outdoor kitchen island is Austin Western Limestone. Want your own covered patio in Houston for enjoying football season outside? Just contact us, and we’ll hook you up! 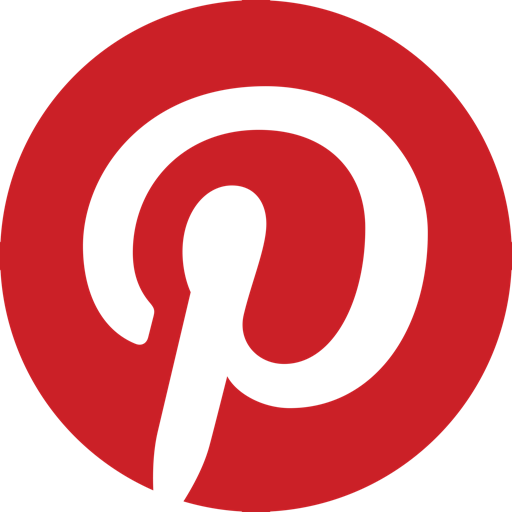 Or, just check out our Houston covered patios on Houzz!